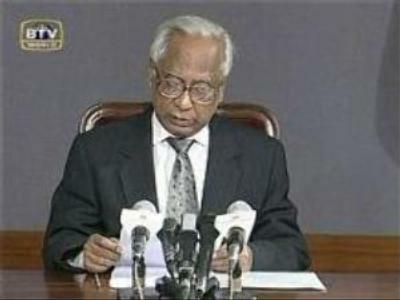 Bangladesh's President Iajuddin Ahmed has stepped down as interim leader. Nine advisers to the government are also reported to have resigned and a night-time curfew has been imposed. This comes just hours after the President reportedly postponed this month's elections and declared a state of emergency in the country. Bangladesh has seen violent protests led by a political alliance that was threatening to boycott the vote, which they claimed would not be free and impartial. According to the constitution, rallies and protests are prohibited under a state of emergency. In addition, private broadcasters have been ordered to suspend their news programmes. The government also indefinitely imposed a night-time curfew in the capital Dhaka and 60 other cities on Thursday.